Download the free activity workbook! Based on Anatomy of the State by Murray Rothbard, our book — The Tuttle Twins and the Fate of the Future — will help young readers understand the age-old battle between persuasion and coercion, and why it's better to pursue voluntary relationships rather than forcing others to do what we want. It's a complex topic that's been wrapped up in a fun story for children young and old. 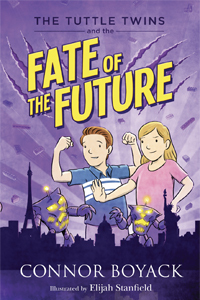 The Tuttle Twins and the Fate of the Future is 62 pages long and full of fun, colorful illustrations. Recommended reading ages 6-12. Click the related videos tab above to watch the Mises Weekends interview with Jeff Deist and the author, Connor Boyack!